Aprilia Racing Team’s Eugene Laverty clocked 2’04.730 seconds to secure his first ever Tissot-Superpole win. After two dry sessions, the third one was red flagged as the rain started to fall on the Norhamptonshire track. The action resumed with a final wet 20-minute Superpole, which saw Laverty getting the best out of a last minute attempt, on an almost dry track surface. Carlos Checa (Team Ducati Alstare) is back on the front row of the grid in second position, ahead of Jonathan Rea (Pata Honda World Superbike). 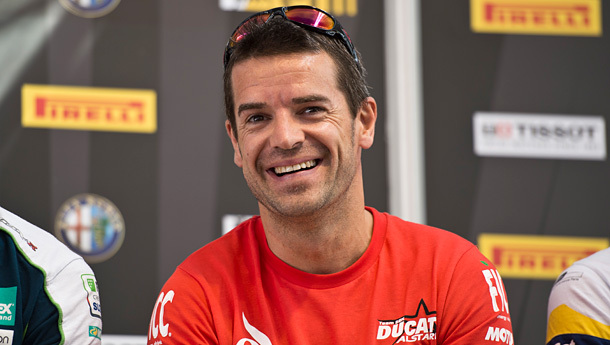 Smiles all round – Carlos Checa is back on the front row for tomorrow’s race. Row 2 will be headed by Loris Baz (Kawasaki Racing Team), who was leading the last session before the rain stopped – allowing riders for a final quick lap – followed by team mate Tom Sykes. The Brit got the worse of today’s Superpole, as just before the red flag came out he set what would have been the new best lap of the circuit. Sykes initially set a remarkable 2’03.362 second lap in the eventually cancelled Superpole Three (with Baz right behind him and also under the previous track best) but that time was nullified when the session was red flagged with four minutes to go. 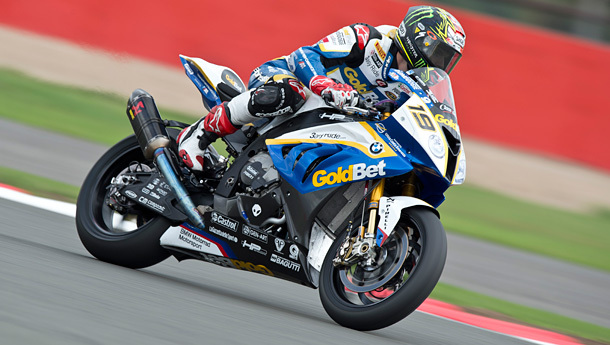 Works BMW rider Chaz Davies ended up sixth, while his team mate Marco Melandri got out of contention early on as he suffered a technical problem on his BMW S1000RR during Superpole 1. Works BMW rider Chaz Davies during qualifying at Silverstone this weekend. Leon Camier (FIXI Crescent Suzuki) and Championship leader Sylvain Guintoli (Aprilia Racing Team) ended up 7th and 8th, with Frenchman stopped by his RSV4 after a technical fault. Ninth place Davide Giugliano (Althea Racing Aprilia) had to sit out the final session due to a crash he sustained before the red flag was waved. An emotional and moving tribute to Andrea Antonelli gathered the entire WSBK paddock on the starting line at Silverstone, together with his Team, Goeleven Kawasaki, Andrea’s bike #8 and the Moscow Raceway Supersport race winner trophy, which was given in his memory. Following this special moment, the eni FIM Superbike World Championship riders went on track for the ninth Tissot-Superpole of the season. Reigning Champion Sylvain Barrier (BMW Motorrad GoldBet) will start tomorrow’s two FIM Superstock 1000 Cup races at Silverstone from pole position, as the Frenchman topped the timesheets in Qualifying 2 courtesy of a 2’07.833 seconds lap-time, shattering the previous record held by Danilo Petrucci (2011). This was the 13th pole position by the Oyonnax-born rider. Barni Racing Ducati duo of Niccolò Canepa and Eddi La Marra, eager to give some hard time to the Frenchman, will move off from second and third place respectively despite a nine tenths gap, while Jeremy Guarnoni (MRS Kawasaki), Lorenzo Savadori (Team Pedercini Kawasaki) and Romain Lanusse (Team MRS Kawasaki) will line-up on the second row on the grid.